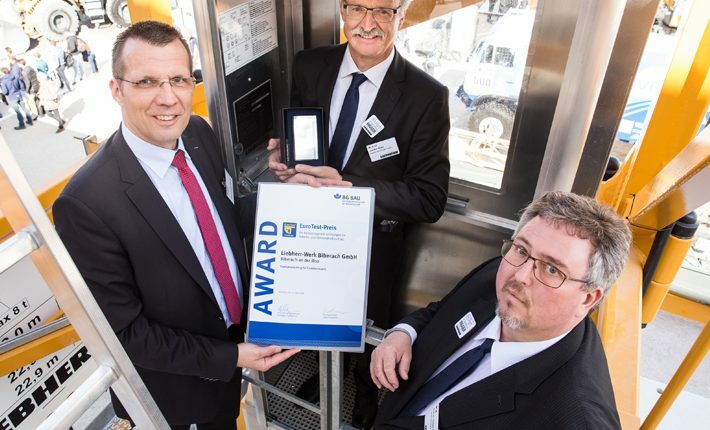 Liebherr-Werk Biberach GmbH and Liebherr-Hydraulikbagger GmbH (Kirchdorf an der Iller, Germany) were presented with two EuroTest awards at Bauma 2016 for occupational and product safety. “Liebherr really deserved the two awards for the innovative technical implementations of the occupational safety and health protection concept”, stated Prof. Frank Werner (BG BAU) praising the applications from the two Liebherr companies. “We are delighted with the award”, stated Prof. Dr. Norbert Stanger, who accepted the award on behalf of Liebherr-Werk Biberach GmbH together with Joachim Mayer. The Biberach-based company received the accolade for the product LiUP. With the crane driver elevator, the crane driver or service employee safely reaches the driver’s cab in roughly two minutes. Following a one-off installation, the guide rails remain in the towers and the elevator itself together with the charging station in a tower section. There is thus no additional assembly and logistics work required for subsequent erection on the construction site.